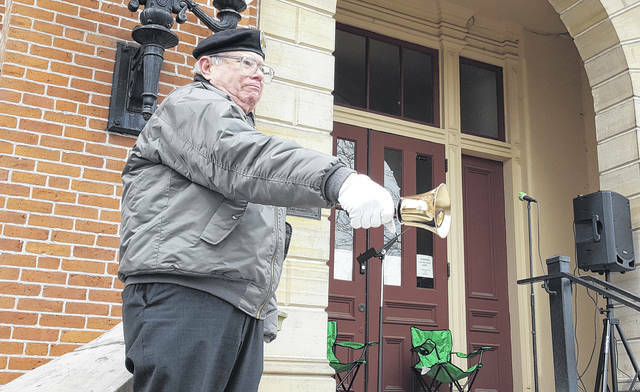 John Crouse, a U.S. Army veteran who served in Vietnam, rings a bell on the steps of the old Delaware County Courthouse in Delaware during a Vietnam War Veterans Day ceremony held Saturday in which the Vietnam Veterans of America Chapter 1095 rededicated the Vietnam memorial located in front of the courthouse. The memorial contains the names of the 10 county residents killed in action during the war. Crouse rang the bell once after each of the 10 names were read aloud. 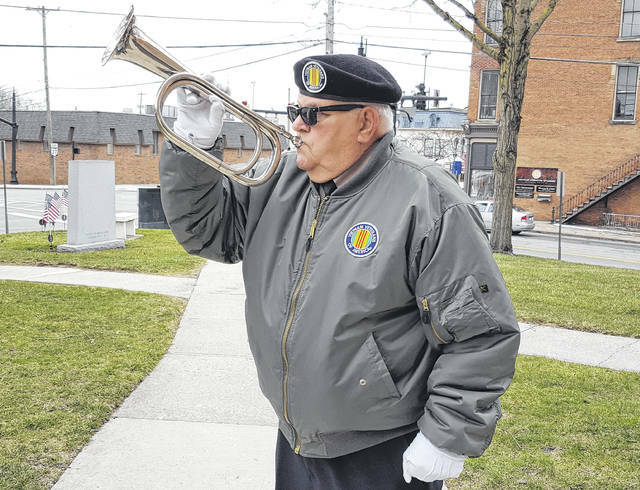 Vietnam veteran Kenneth Cox, who served in the U.S. Army for 14-plus years, plays “Taps” during the Vietnam War Veterans Day ceremony held Saturday in front of the old Delaware County Courthouse in Delaware. A year ago, an act of Congress was signed into law by President Donald Trump designating March 29 as National Vietnam War Veterans Day. In honor of the newly created day commemorating all the veterans who served in Vietnam, the local Vietnam Veterans of America Chapter 1095 held a ceremony on Saturday in front of the old Delaware County Courthouse, 91 N. Sandusky St., Delaware. VVA Chapter 1095 President Harold B. Wolford said March 29 was chosen as the date to honor Vietnam veterans because on that day in 1973, the last U.S. combat troops left Vietnam. Wolford added a lot has changed in the eyes of the public concerning the Vietnam War and the 9,087,000 military personnel who served on active duty during the Vietnam era (1964-1975). “Unlike 40 to 50 years ago, now 87 percent of Americans hold Vietnam veterans in high esteem, which is a nice change from when we got out,” Wolford said. During his keynote address on Saturday, VVA Chapter 1095 Chaplain Dwight Cimino said he has a patch at home that displays the number “58,479,” which represents the American service members who gave the ultimate sacrifice during the war. Cimino, who served three tours in Vietnam, said he and the others he served with didn’t volunteer for service to protect the U.S., Ohio or Delaware County. Cimino added a lot of people believed then and still believe today that America’s involvement in Vietnam was a wasted effort. He, however, doesn’t see it that way. “I’m here to tell you it was not a wasted effort,” Cimino said. “When we left in 1975, the gross domestic product (GDP) of Vietnam was about $4 million American dollars. The gross domestic product of Vietnam for 2017 was just a little over $200 billion. “I’d like to say, and I believe, I had something to do with that. I’d like to say, and I’d like to believe, that all of the military people who had boots on the ground and were there had something to do with it,” Cimino added. He closed his address to the crowd by stating the Vietnamese people simply wanted what Americans have — freedom. During the Vietnam War Veterans Day ceremony on Saturday, the VVA Chapter 1095 rededicated the Vietnam memorial located in front of the old courthouse. The memorial contains the following names of the 10 Delaware County residents who were killed in action during the Vietnam War: Stephen T. Hepner, Norman R. Anderson, Alan R. Smith, Ronald D. Poole, Robert R. Thompson, James R. Carr, John L. Espenshield, Robert E. Lowe, Larry W. McKee and Phillip L. Lee. Contact Joshua Keeran at 740-413-0900. Follow The Gazette on Twitter @delgazette.